Leader of the pro-Biafra group, Biafra Zionist Movement, BZM, Barrister Benjamin Onwuka, has claimed responsibility for last Saturday’s invasion of Enugu State Government House. 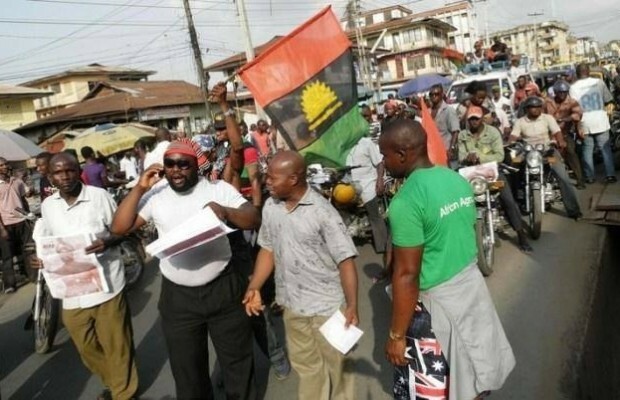 According to him, members of the group took control of Enugu State seat of power for about four hours after they successfully hoisted the flag of the Republic of Biafra and some banners at the main gate. He briefed some newsmen at the Nigeria Union of Journalists, NUJ, Press Centre, Enugu, yesterday, where he claimed responsibility for the invasion, which he said was primarily to reclaim the old headquarters of the former Biafra Republic. Onwuka dismissed speculations that the group was sponsored by politicians in Enugu State, explaining that the major target of the BZM members was to hoist the Biafran flag as a symbol of rebirth of the defunct Biafra Republic. He said members of the group, who were not armed and had no charms whatsoever, were at Government House from 3 a.m. to 7a.m. before soldiers dislodged them, insisting that they accomplished their mission. He, however, warned that Nigeria should vacate the Biafran territory before March 31, 2014, or risk a bloodbath , disclosing that his group had concluded plans to take over total control of Biafra land from April 1. Said the BZM leader: “I want to let you know what happened on March 8 at the Government House Enugu. This is to confirm the true report about what happened. You know very well that since January 12, 1970, the flag of Biafra has never rested on the Government House in Enugu which is the centre power of the Biafra people. “What we did on the 8th is to reconfirm the independence of the Republic of Biafra which we successfully did. “We didn’t attack the Government House, but we captured it back for the Biafra people. We captured it for four hours and there was a battle between the Biafrans and the Nigerians and by 7a.m., we retreated because we didn’t have any weapons in our hand, to avoid any loss of life. “The reason we did it was to show the Biafra people that the hope for Biafra is still alive and that nothing shall quench the aspiration of the Biafra people to be independent. That independence has been resurrected. So the Biafran flag was raised at the Government House on the 8th of March, 2014 and I, Benjamin Igwe Onwuka led the operation. “It wasn’t an armed attack on the Government House, it wasn’t kidnappers as the police have said. It was Biafran people and the Biafra Zionist Federation led it and I, Benjamin Onwuka was the man that pioneered it. It wasn’t an attack on any- one, but for the restoration of the independence of the Republic of Biafra. Continuing, Onwuka said: “I want the Biafra people to know and the entire world that the Biafra has been resurrected and no force of arm could hinder this aspiration for Biafra. “Let me make it clear. the states that will make up Biafra now are Benue, Kogi, Delta, Edo, Bayelsa, Rivers, Cross Rivers, Akwa Ibom, Ebonyi, Anambra, Enugu, Imo and Abia and Southern Ondo. This entry was posted in News, Politics, Relationships and tagged Biafra Zionist Movement: We seized Enugu Govt House For 4 Hours.